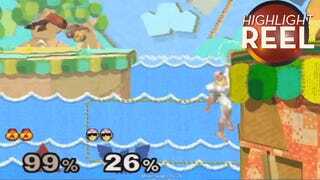 If you think "I've done some pretty amazing Falcon Punches before", just ask yourself: did your opponent just quit the game after you did it? And, as always, much more! At the Vegas Smash meetup, Geoff timed this Falcon punch so incredibly well that his opponent, dansdaman, just sacrificed his last stock and jumped off the edge of the stage.